Why is Anglo So Costly for the Taxpayer? Brian Lenihan, the finance minister, said last week that the plight of Anglo Irish Bank was a reminder that nationalisation carried a heavy price for taxpayers. Lenihan held up Anglo as a warning to academic economists who support the nationalisation of Ireland’s big two banks, Bank of Ireland and Allied Irish Banks. Anglo’s need for capital “illustrates the point that, when nationalising a bank, there is an issue for the taxpayer”. Ok then, perhaps I shouldn’t bother taking the bait at this point, but let’s think about this for a second. Suppose Anglo had remained in private hands after last Autumn, perhaps with new management after Seanie and co were cleaned out. Now they report losses that wipe out their capital base. So, because of the September 30 guarantee, the government would be forced to re-capitalise Anglo now, whether the bank had previously been nationalised or not. To blame the cost of re-capitalising Anglo on the decision to nationalise is putting the cart before the horse. The principle argument in favour of nationalising Anglo was that the government had guaranteed its liabilities and could not afford to keep a discredited management in place gambling with taxpayers money. I would summarise the moral of the story here somewhat differently: When issuing blanket guarantees to troubled banks, there is an issue for the taxpayer. Author Karl WhelanPosted on May 31, 2009 June 10, 2009 Categories Banking CrisisTags Anglo Irish, Nationalisation15 Comments on Why is Anglo So Costly for the Taxpayer? In response to a recent paper that was somewhat bullish about the benefits of the European employment model, Bryan Caplan proposes the following bet. It has since been taken up by John Quiggin. Once we have banks that have been re-capitalised and apparently stable once more, where does our financial system go? In negative terms, how can we be assured that the financial system will not generate crises on the kind of scale that we are currently living through? In positive terms, how can we increase the chances that finance flows toward productive rather than speculative uses? These critical questions are largely sidelined in the current debates on nationalization, which have focused largely on the (urgent and very important) questions of how to restore the stability of the banking system and who will end up stuck with the bill. But, even if this is achieved at the least possible cost to the taxpayer (and therefore with the least possible constraint on public investment into the future), this still leaves the questions of stability and productive investment. There is little reason to suppose that an unreconstructed banking system will deliver this on its own – the banking system provided neither stability nor productive investment before this crisis. Reform of banks themselves will be essential, although this has largely disappeared off the agenda in recent months. There are five areas through which we can influence how banking practices are shaped by the wider system of financial governance (some of these are usefully reviewed in Stiglitz and Uy’s account of the ‘East Asian Miracle’). In each area, the system has left a great deal to be desired and requires reform. Anglo Irish Bank has announced losses that bring its measured shareholders’ funds down to about 0.1 per cent of total assets — effectively zero. It has also announced a further €3.4 billion in expected loan losses, little of which would be offset by operating income over the next year or so. From a strict contractual point of view, the next in line for absorbing these losses are the subordinated debt holders. There has already been some discussion on this site of the issues involved here. Now we are at a crunch point because a recapitalization of Anglo cannot be long-delayed. Indeed, to continue trading, the bank presumably needed the assurance that was provided by the Government today that needed capital would be forthcoming. There is €2.8 billion of unguaranteed sub-debt on Anglo’s books. I am assuming that part of the Strategic Plan promised by the bank this morning will have to involve risk-sharing by sub-debt holders. This could take the form of of a deeply-discounted buy-back (as indeed is already suggested in the Government’s statement). It could also take the form of a debt-equity swap. (This would parallel current discussions in the US around debt-equity swaps to recapitalize some of the larger US banks following their stress-tests). Obviously none of this is easy, and these bondholders may want to play chicken. In a liquidation they would be wiped out, but — absent modern bank insolvency legislation here — a messy liquidation could also inflict severe taxpayer and economic costs. I admit that I am not sure of the most effective way of accomplishing it. There are some obvious options. Perhaps readers will have some further ideas. I am sure that officials are pondering these issues. But difficult does not mean impossible. The stakes here are evidently high. Urgent work to modernize bank insolvency procedures (as recently enacted in the UK post Northern Rock) could strengthen the Government’s hand. According to Brian Cowen, “most economists now say that the Government’s strategy for the public finances is the right one”. Yes, most economists — indeed practically all economists — agree that the Government has to do everything possible to avoid State bankruptcy, and that the Government is now taking required action on the public finances. However, the fact that the Government is cutting expenditure and raising taxes as severely as it now has to, thus lowering aggregate demand and worsening unemployment at the worst possible time imaginable (we can argue about the size of this effect, but its sign is in no doubt) is a damning indictment of Fianna Fáil/PD fiscal policy over the past few years. Bradford and Bingley Precedent for Anglo Debt? Bradford & Bingley, the nationalised mortgage bank, quietly issued three statements after the market had closed on Tuesday, informing holders of three classes of notes that they would not now be getting their next due interest payment. The FT notes that the market value of these bonds collapsed on this news. Anglo’s perpetual bonds have been trading at about 15% of par value lately. the Government has decided, subject to EU approval, to provide up to €4 billion of capital to Anglo. The bank is also in a position to generate further capital of its own by buying back certain outstanding subordinated loans from bondholders at a significant discount to par value. This exercise will generate profit and additional capital for the bank. See page 50 of the report’s PDF file for details on Anglo’s subordinated debt, which has a book value of €4.9 billion. About €2.1 billion of these bonds are dated, and thus covered by the guarantee up to September of next year (though the earliest maturity is 2014). The remaining €2.8 billion are undated and are not covered by the guarantee. Author Karl WhelanPosted on May 28, 2009 June 10, 2009 Categories Banking CrisisTags Anglo Irish, Nationalisation10 Comments on Bradford and Bingley Precedent for Anglo Debt? Who pays the cost of food safety? Author Alan MatthewsPosted on May 28, 2009 Categories Uncategorized4 Comments on Who pays the cost of food safety? Is Dublin Missing out on Climate Change? The concept of “global warming” or, more vaguely “climate change”, is now deeply embedded in the public’s consciousness and indeed in the economic agenda of most developed countries. Expensive policy responses are being put in place to avert possible future environmental damage. However, as has been pointed out by Richard Tol, “the impact of climate change on Ireland is [likely to be] moderate”, although he argues that as a constructive contribution to the global problem we should introduce a carbon tax. This Post is prompted by my puzzlement at the contrast between predictions that our climate is heating up and the prospect of the third dismal summer in a row, coming on the heels of a severe winter and “broken” spring weather. The Mean annual temperatures in Ireland have risen by 0.74°C over the past 100 years (McElwain and Sweeney, 2007). This increase largely occurred in two periods, from 1910 to the 1940s and from the 1980s onwards, with a rate of warming since 1980 of 0.42°C per decade. In Ireland, 6 of the 10 warmest years have occurred since 1995 with the warmest year within this period being 1997. From this quotation it is clear that the trend in average temperature in Ireland was quite erratic over the twentieth century. Issues such as trend breaks, autocorrelation, and statistical significance, need to be addressed, as does the relevance of jumps in temperature early in the twentieth century for trends in the twenty-first century. The projections show that average temperatures will rise by 1.4°C to 1.8°C by 2050, and be in excess of 2°C relative to the 1961-1990 baseline by the end of the century. Technically, it dynamically downscales the relatively coarse-grained information produced by global models to tease out the finer details over a smaller area. This approach – regional climate dynamic modelling – is unique in Ireland. The work is done in collaboration with the Meteorology and Climate Center at UCD, and more recently, with the Irish Center for High-End Computing (ICHEC). At a simpler level, a visit to the CSO Database under Environment, Climate opens up fifty one years of monthly data on temperature, rainfall, sunshine, and wind speeds for 15 weather stations across the Republic. This wealth of easily-accessible data could help take your mind off the banking crisis during the wet summer months. More seriously, I thought it was worth mining these series to see if the effects of climate change can be discerned in this record of the last half century of weather. 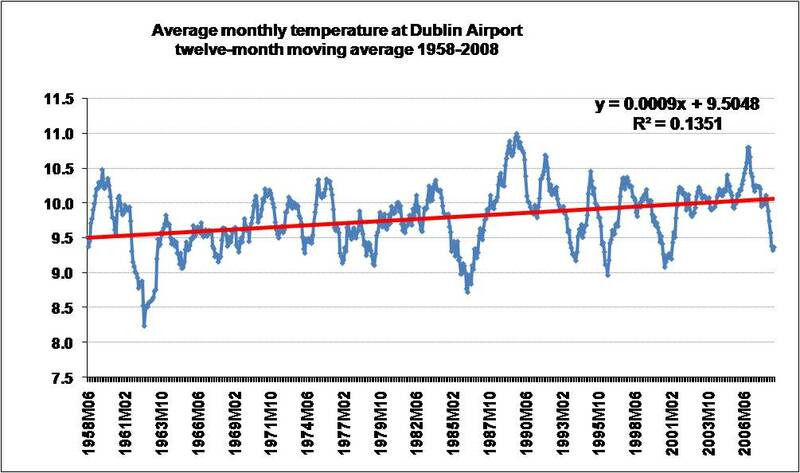 I selected for analysis the mean monthly air temperature at Dublin Airport over the period January 1958 through April 2009 in the belief that this is a meaningful indicator of the climate affecting the largest concentration of population in Ireland. This simple approach raised some interesting issues. 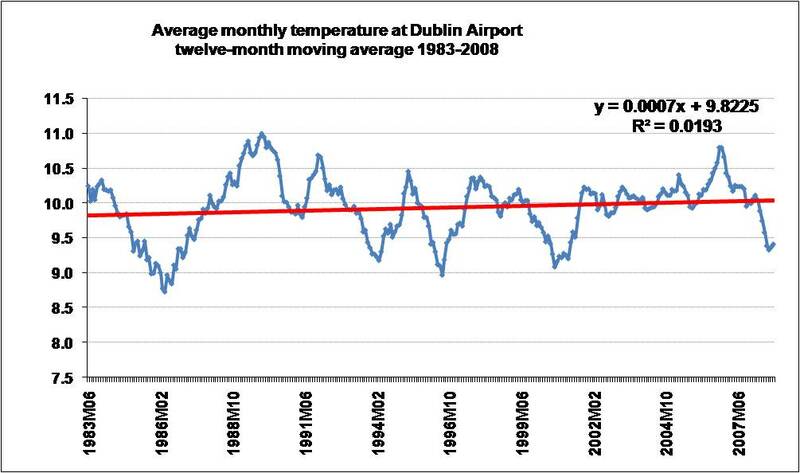 This first Chart shows the twelve-month moving average of Dublin’s temperature over the period January 1958 to April 2009. Even when seasonal effects are removed, the series is very erratic. Periods of cooling have been abruptly followed by warming periods. For example, temperatures fell sharply between 1983 and 1986, but then there was a period of noticeable warming from mid-1986 to late-1989. 1986 was the second coldest calendar year in the 51-year period, but 1989 was the warmest. It is especially striking that the series is very erratic and trendless over the last twenty years. The average temperature (9.4⁰ C) for the most recent twelve-month period, May 2008 to April 2009, was below the mean (9.8⁰ C) for the whole fifty-one year period and almost the same as that for the year 1958 (9.5⁰ C). The winter of 1962/1963 was savage, the coldest for more than 200 years outstripping even ‘white 1947’ for bitter temperatures . . . It began freezing on Christmas Day in 1962 and barely relented until March. By early January 1963 much of Britain and the eastern part of Ireland were blanketed in snow. This exceptionally cold period is still included in the baseline (19861-1990) for average temperatures used on the Met Éireann site. However, selective illustrations do not prove anything. The Chart shows the trend line through seasonally-adjusted data. The trend is positive and significant, but not impressively so. Moreover, it is not stable, as is shown in the following Chart for the 25-year period 1983-2008. Over this period the positive trend is not significant. These results illustrate uncertainties about global warming in the Dublin area. While all the estimated trends are positive, they are at best weakly significant and provide a wide range of estimates of the pace of warming. The most recent data provide the least support for the warming hypothesis. Changes in summer and winter weather are probably more economically significant than changes during the transitional seasons of autumn and spring, so it is worth looking at the evidence by season. 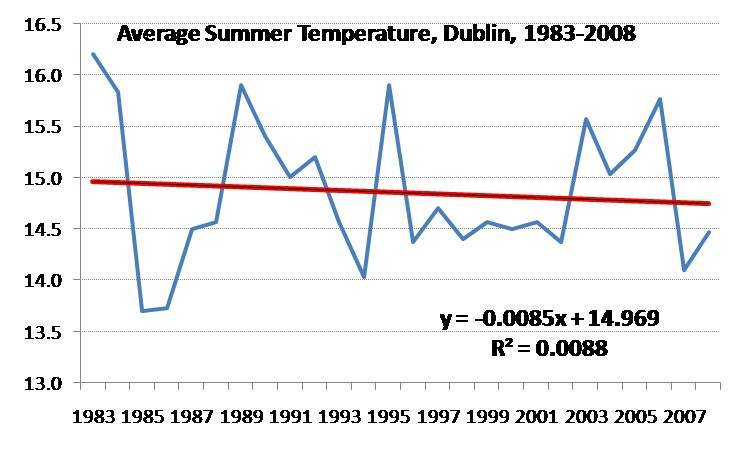 Dublin readers may take little convincing that our summers have not been getting much warmer. The graph shows that the city has not experienced a really warm summer since 1983. The time series show that while over the 51-year period 1958-2008 there has been a small positive trend, it is not statistically significant (R2=.068, P=.0648). If we confine our attention to the second half of the period – 1983-2008 – the trend is negative (but not statistically significant). A common perception is that our winters have been getting milder, but it is possible that we are still influenced by memories – or accounts – of the exceptionally severe winters of 1947-8 and 1962-3. 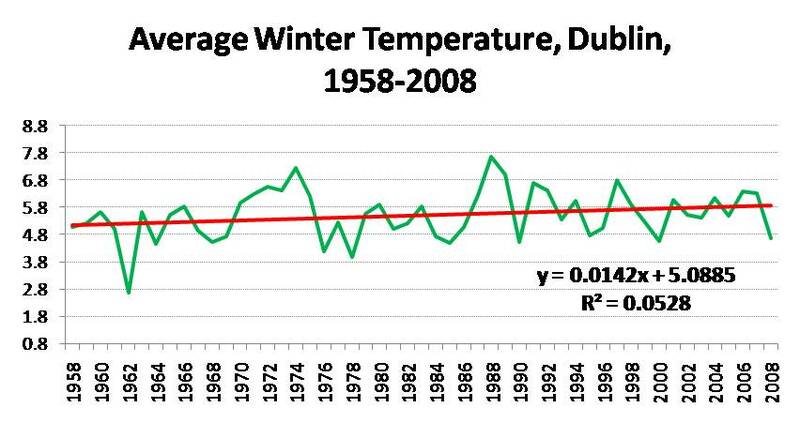 The statistical evidence for milder Dublin winters is weak. While over the 51-year period there is an upward trend, but its statistical significance is low (R2 = 0.0462, P=0.14). Over the second half of the period, the trend is negative, but the R2 is a non-significant 0.0001. Well, perhaps we are enjoying warmer /mellower autumns? Not significantly. With R2s of 0.0096 and 0.03, the trends in autumn temperatures over the 51-year period and the second 25-year period are not significantly different from zero. Warmer /earlier springs, perhaps? Maybe. 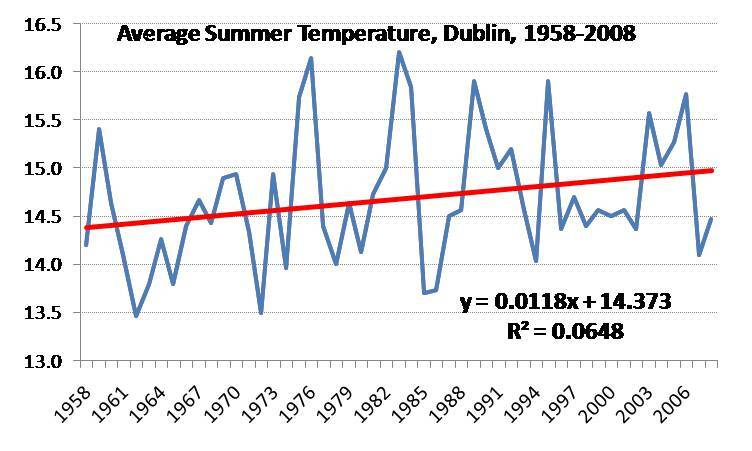 The trend coefficient for the full 51-year period is almost significant at the 0.05 level, implying an increase of about 1.2⁰ C a century in Dublin’s average spring temperature. However, the trend over the second 25-year period, 1983-2008, is not statistically significant (the R2 falls to 0.0445). 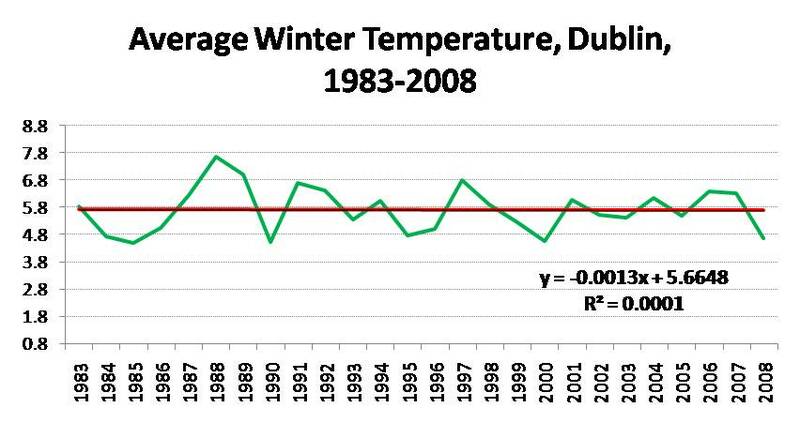 Overall, then, the data for Dublin’s temperatures suggest some weak evidence of a slow upward trend over the 51-year period 1958-2008, but none over the 25-year period 1983-2008. There has been no warming in summer or winter, but perhaps during the transitional seasons. Of course, temperature is only one dimension of climate and change may be occurring on other dimensions. The most frequently mentioned possibility is that the warmer Atlantic Ocean will lead to stormier and wetter weather across Ireland. 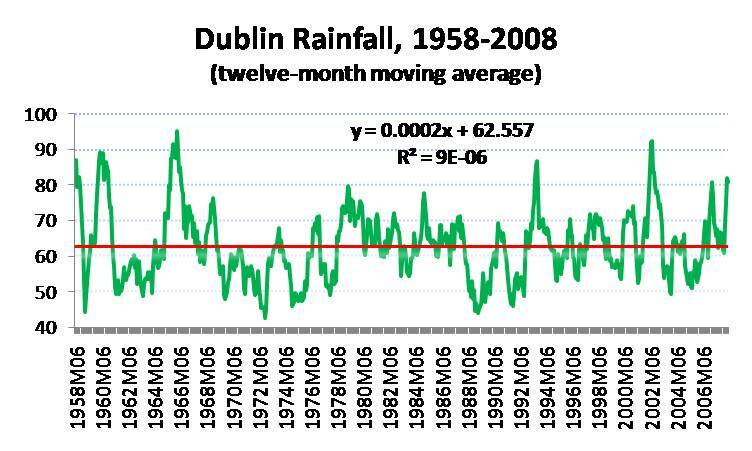 However, the evidence for Dublin does not support this view – although very variable, Dublin’s rainfall shows no trend over the last half century. As mentioned above, extremes are important in the climate change literature. However, extremes – especially of rainfall and wind speed – can be very local. The heaviest downpours tend to be produced by thunder storms confined to small areas. The highest rainfall recorded over a 24-hour period (184 mm) in Ireland was measured during a thunderstorm in Mount Merrion, County Dublin, on 11th June 1963. (For this and other nuggets see The Climate of Ireland by P. K. Rohan, The Stationery Office, Dublin, 1975). The series on the CSO website for “Most Rain in a Day” provides rainfall extremes for the 15 weather stations. Over the the 1958-2008 period the evidence for Dublin is of considerable variability but no trend. The wettest day in the whole period at Dublin Airport was in June 1993, when 82.3 mm were recorded. But wettest day in the following year, 1994, had only 21.8 mm of rainfall. (The only month over the half century in which no rain was recorded was April 2005). Estimates of sea level rise from satellite observations around Ireland are consistent with the global picture: increases of 2.3 to 4.7 mm/year since 1993. At current rates of change, mean sea levels in Dublin, Sligo Bay and Slea Head will be 25, 44 and 40 cm respectively, above present day levels by the end of the century. In light of what seems like an estimated 45 mm rise in sea levels over the last 15 years, it is strange that there does not seem to have been much reporting of increased coastal flooding over recent years. This note is about the Dublin area. There is considerable variation in climate – and possibly in climate change – within relatively small geographical areas. There certainly is a lot of variation in the weather across Ireland – for example, summer 2007 was quite good in the West but terrible in Dublin. A sampling of data from other Irish weather stations provides stronger evidence for warming – with much higher correlations and more consistently significant positive trends. However, even in the south and west the estimates of trends are quite unstable. For example, the data for Shannon Airport show a strong positive trend in temperature over the 51-year period 1958-2008, but no significant trend for the most recent 20-year period and a negative (and significant) trend over the past 10-year period. There is not much support for the view that things have been getting stormier – in Belmullet there has been no trend in maximum wind gusts since 1958 and no trend in rainfall over the past twenty years. To conclude: The implications of climate change – and of our reaction to the fear of climate change – are too important to be ignored by economists. In the face of uncertainty there is a strong argument for erring on the side of caution, so that even weak evidence of warming might be justification for strong policy responses. But reliable estimates of past trends are nonetheless essential for the projections of future trends on which these responses should be based. Author Brendan WalshPosted on May 28, 2009 May 28, 2009 Categories Environment50 Comments on Is Dublin Missing out on Climate Change? A new NBER paper asks why universities reward faculty on the basis of research productivity despite making most of their money from teaching. One theory is that top researchers being located in an institution increases the signalling value of the degrees awarded in the Institution. Another is that screening faculty on the basis of good teaching is very difficult and that screening them on the basis of research is more feasible and that good researchers are likely to be good teachers and to transmit knowledge at a much higher level than faculty who are not research active. A question that the paper leaves open but is an important one is what is best for students and society in terms of the allocation of university budgets. Should we be focusing on getting more teaching staff and having them spend more time in the lecture hall and classroom or more on attracting top research staff to improve the prestige of institutions and facilitate students being influenced by top researchers? Author Liam DelaneyPosted on May 27, 2009 Categories Uncategorized27 Comments on Teaching or Research? Measuring bang-for-buck is crucial in cost-benefit analysis of government programmes. We need a reasonable bang-for-buck metric to evaluate the cost-benefit of NAMA and alternatives. As I have argued in an earlier post, the main objective of NAMA is to increase risky lending to Irish businesses. This leads to an obvious cost-benefit metric for NAMA and alternatives: Euros of additional commercial lending by banks generated per Euro of risk capital provided to the banks by the government. I will call this the risk capital bank lending multiplier. How big is the risk capital bank lending multiplier of the NAMA plan? It should be substantially higher than the banks’ normal equity leverage ratio to justify government intervention. If the multiplier is less than 10, then some alternative, perhaps do-nothing as a cautiously sensible choice, is preferable. The multiplier is not a comprehensive measure since the type of induced lending also matters. If an injection of risk capital can induce the banks to change the composition of their loan books, with more high-risk entrepreneurial loans and fewer safety-first mortgages, this could be employment and growth-enhancing even if total loans do not increase. The multiplier does not capture this but it is still a useful, partial measure of policy effectiveness. Risk capital is not identical to equity capital, although providing new equity capital is one method of risk capital provision. When NAMA purchases risky loans from banks for cash, it is injecting risk capital into the banks. The government’s blanket guarantee on bank borrowing is also a type of risk capital injection into the banking system. Different types of risk capital can be standardized by scaling them using a reward-to-variability ratio. So if NAMA purchases a portfolio of risky loans with annual volatility of 20 billion Euros and we assume an equity risk-to-variability ratio of 0.20 than this is equivalent to 4 billion Euros of equity capital. This is only a rough guide since volatility is not a uniformly reliable measure of risk. NAMA, NTMA acting on behalf of NAMA, or a government agency should provide a credible case that the risk capital bank lending multiplier for the NAMA programme is large enough to justify the trouble and expense. Now that the transcript is available, it’s clear that lots of interesting stuff came up at yesterday’s Oireachtas Comittee meeting on NAMA, most of it unreported by the press. Here’s a collection of statements I found interesting. Peter Bacon: It will be set by reference to the market. The market, as you know, has fallen dramatically. And I think people have overestimated the difficulties in estimating what these market values are. John Murray: At the moment there is no market. Peter Bacon: Well, there is a market. John Murray: Nothing is selling. The WSJ devotes front-page space to Chile’s success in saving for a rainy day during the boom times: you can read it here. Following the publicity given last week to the Concluding Statement of the IMF’s recent Article IV Consultation Mission to the UK, I decided to check it out for myself. There is a full list of recent Concluding Statements here. As you can see, Ireland is conspicuous by its absence from a very comprehensive list of countries. This is not because Article IV consultations are not done here, since they are. So, what explains our absence from the list? Have Concluding Statements never been published for Ireland, and if so, why is that? Or, were they published at one time, and was publication subsequently halted — and if so, why? Ashoka Mody of the IMF has written an interesting paper on European sovereign spreads: more details here. Mr McDonagh made a similar point today to the Committee saying: “We believe the Government is basically interested in keeping banks listed and relies on Nama to trigger a change of market sentiment”. JPMorgan Chase analysts wrote in a note today: “We thus see sizeable chances of a smaller haircut to avoid further capital needs”. Update: Here‘s the full text of the meeting. Correction: It turns out that Mr. McDonagh did not say the line that the Irish Times had attributed to him (the updated version of the story no longer contains this quote.) I had scanned the transcript to see did he say this line, which appeared a strange one to me. In fact, this line is also an excerpt from the JP Morgan note. Apologies for misleading readers by relying on our so-called paper of record. A Prediction Market for Irish Toxic Assets? Alan Holland of UCC has a paper proposing a prediction market to forecast prices for “toxic assets” to be transferred from Irish banks to the National Asset Management Agency (NAMA). Abstract below and the full paper is available here. (i.e. induce truthful reporting) and robust to strategic manipulation. We propose that a prediction market is run in parallel with the pricing procedure recommended by the European Commission. This procedure need not necessarily take heed of the prediction markets view in all cases but it may offer guidance and a means of anomaly detection. An online prediction market would offer everybody an opportunity to ‘have their say’ in an open and transparent manner. Author Philip LanePosted on May 26, 2009 May 26, 2009 Categories Banking CrisisTags NAMA, prediction market5 Comments on A Prediction Market for Irish Toxic Assets? On today’s RTE Radio News at One, David Murphy made a point about NAMA that I’ve heard many times recently but that I’m having great difficulty understanding. Murphy explained that the government bonds issued to purchase loans for NAMA would imply a large interest bill and that the idea behind NAMA purchasing good property loans as well as bad was so that the good loans could help to pay the interest on the NAMA bonds. Let me explain why I don’t understand this. Eoin O’Leary provides a critique of the government’s overall economic policy strategy here. The NYT provides an interesting profile of the Latvian economy here. Last night’s The Week in Politics on RTE featured an important discussion between the Minister for Finance, Brian Lenihan, and Fine Gael finance spokesman, Richard Bruton (The discussion is in the first clip on the webpage after Brian Dowling’s report). They discussed a number of issues such as NAMA and Anglo Irish Bank. However, to my mind, the most important discussion related to bank bond holders. Oliver O’Shea presents the flow approach to managing the banking crisis in this article. The Irish Independent reports the views of a senior IMF official on NAMA here.